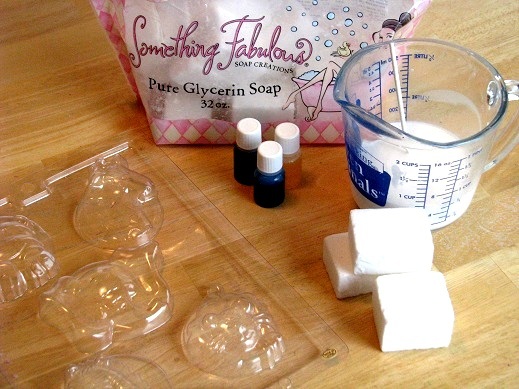 Want to Make Homemade Glycerin Soap ? 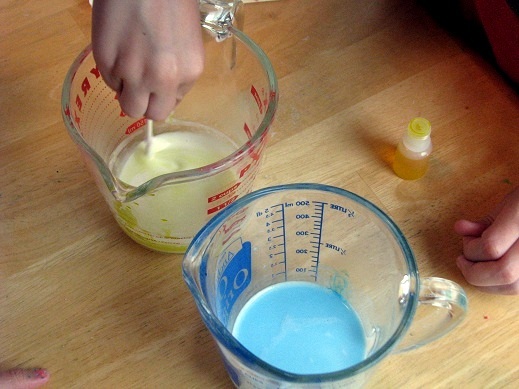 What a fabulous spa product to make with the kid’s.. “Homemade Glycerin Soap” from the “Gluestick ” blog… Brandi creates the most fabulous DIY projects with her kid’s. 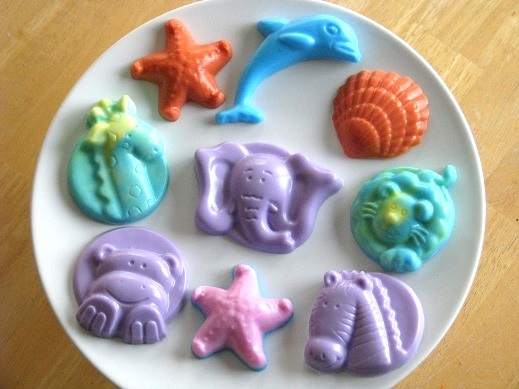 So let’s spend a day with her and make some of these cute soaps ! We made homemade soap for the first time last week and it was SO MUCH FUN! I had no idea how easy it was to make and inexpensive! For some reason I thought it had to be done in a double boiler, mix ingredients, etc. Now that I know how easy it is to make I want to make more! 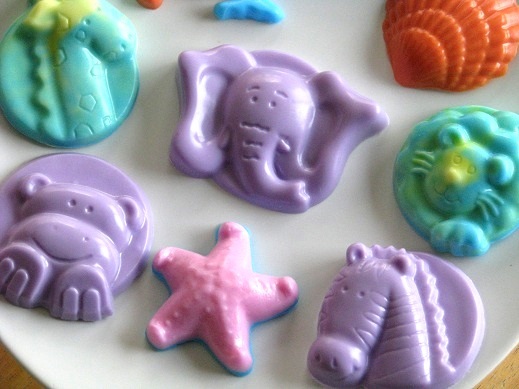 Different types of glycerin, different molds, colors, herbs and other add-ins….the possibilities are endless! And they would make great gifts! I found everything I needed at Hobby Lobby. 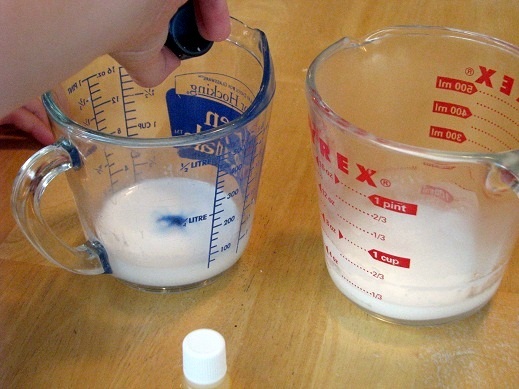 Place your bars of glycerin in the glass measuring cups and microwave on high 30 seconds at a time (stirring after each 30 seconds) until melted. Ours took about 45 seconds and we did 3 blocks at a time. Add your colorings and scents….we used “apple” and stir. My Kaylee loves mixing colors and stirring. 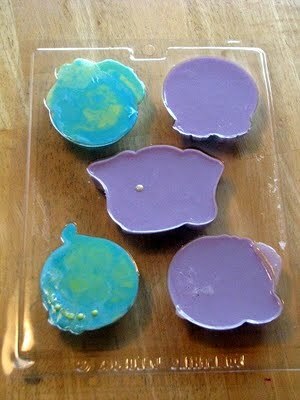 My Aaron (who is 5) was able to pour the glycerin into the molds. He did a great job! Let stand for 1 hour, then pop out of the molds. That’s it! They smell amazing and are so bright and colorful! We decided to save the rest of the supplies to use another day when these run out. We can’t wait to make more! I just love these, wouldn’t they look so yummy in the kid’s Easter Baskets, instead of all that candy. Oh yes , you will have to mention they are SOAPS ! So have a fun filled day and Thank You for stopping by. 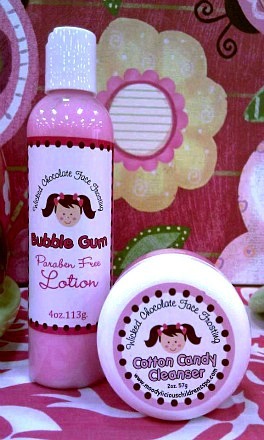 Grab Some Of Our Yummy Spa Products In The Shop !